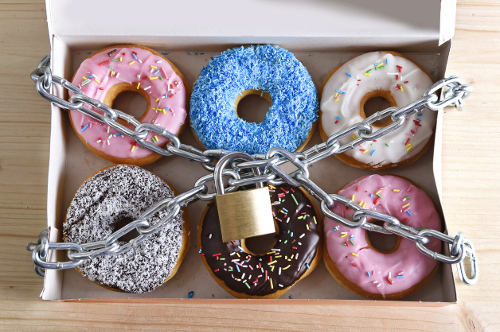 Home » Food and Nutrition » Addicted to Sugar: What Happens When You Give It Up? Have you ever tried to cut down on sugar, only to fail a couple of days later? Or how about eating a whole package of cookies, when you only meant to eat just one? There are also those late-night cravings that have you reaching for something sweet. If any of these scenarios sounds familiar, you are most likely addicted to sugar. But can cutting it out of your diet really help with health problems? The evidence that we need to cut down on our intake of sugar is becoming overwhelming. With so many different types of sugar—and our modern lifestyle habits of eating processed foods—research has shown that the average American consumes 22 teaspoons of sugar every day. Many of the most prevalent diseases and ailments in society today can be linked to our high sugar intake. We know that sugar is linked to an increased risk of diabetes and heart disease. And now even Alzheimer’s disease has mounting evidence to suggest it is intricately connected to insulin resistance. And each day there is more and more research showing some major connections between the effects of sugar on the body and the onset of chronic diseases. I tell all of my clients, “If you want to get healthier, cut out the sugar.” But I will not pretend that cutting sugar out of your diet will be easy, and that you will not experience any withdrawal symptoms. Exactly what you experience when you ditch the sugar will depend on the size of your sugar habit. If you are on the high end of sugar consumption, you can expect to show addict-like withdrawal symptoms, including depression, restlessness, and anxiety. The upside of ditching the sweet stuff, however, will heavily outweigh any side effects that you may experience. You may feel cranky for a while when you first ditch sugar. But once you get through it, you will likely feel better than ever! If you are one of the millions of people suffering with high blood pressure and high cholesterol, then limiting your sugar intake would help you immensely. According to research from James J. DiNicolantonio, a cardiovascular research scientist, sugar chronically raises insulin levels, which activates the sympathetic nervous system, increasing blood pressure and heart rate. When sugar intake has stopped, within a few weeks, you might expect to see a 10% decrease in LDL cholesterol and a 20% to 30% decrease in triglycerides. Your blood pressure will also head in the right direction. If you suffer from sleepless nights, then giving up sugar may benefit you as well. Consuming sugar throughout the day can leave you sluggish. It can also trigger the release of the hormone cortisol, which can interfere with slumber. Give up sugar and you will be more awake and alert during the day! We pretty much all have an extra 10 pounds to lose, and cutting out sugar will make the process much easier. Reducing your sugar habit by 200 calories a day could help you drop those extra pounds in five to six months. It is easy to reduce the calories by swapping out a sugary snack for something like raw almonds. Suffering from brain fog? Sugar may be to blame. A study done at UCLA concluded that a diet high in sugar can damage communication among your brain’s cells, hindering learning and memory. If you want to reduce the amount of sugar in your diet, start by cutting out processed foods. Learn to read the nutritional information on packaged products, so you can make informed decisions when grocery shopping. If you take sugar in your tea or coffee, try cutting it down half a teaspoon at a time. Eventually, you get used to the taste and don’t need it anymore. I get it. Cutting sugar out of your diet can be frustrating and hard at first. You feel like there is no point of living anymore! But, I can reassure you that once you get past your cravings, you don’t miss it and it does get easier. Wouldn’t you like to give it a try? There is nothing to lose. You could enjoy more energy, have fewer mood swings, sidestep major disease, and even support healthy weight loss. “What Happens to Your Body When You Eat Too Much Sugar?” Dr. Mercola; http://articles.mercola.com/sugar-side-effects.aspx, last accessed June 19, 2017. Cicero, K., “7 Things That Happen When You Stop Eating Sugar,” Prevention, August 31, 2015; http://www.prevention.com/health/what-happens-when-you-stop-eating-sugar, last accessed June 19, 2017.